Indigo Skinny is our interpretation of the classic American blue jean for women. The color represents authentic denim. The wash is versatile. 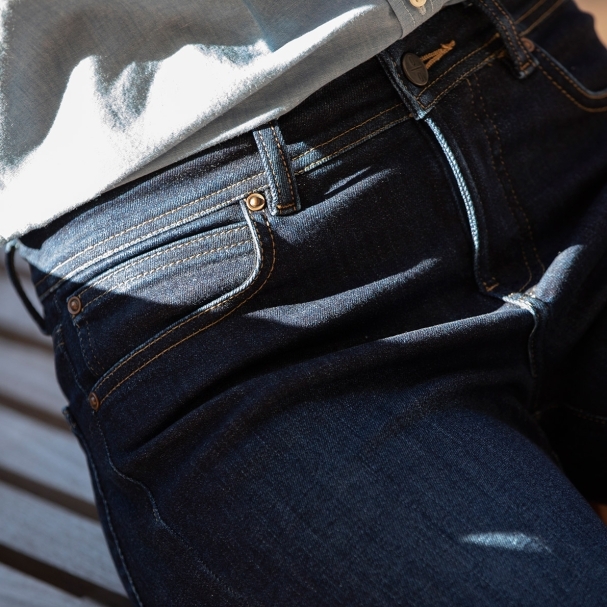 And the denim has just enough stretch to fit your body comfortably, while still feeling like a real jean. Over the past few years, we have tested several denims from the world's best mills. We believe this denim best represents the American Skinny. Model is 5' 9" wearing 26 Basic, Standard Knee-to-Ankle and 31" Inseam. When there's no particular rush, increase effeciency with Group Production - and save. Which jean fit do you typically choose? Thank you, within one business day, we will be in touch with your results. We review your fit options from previous orders, not just your last order, and ask you to confirm before your order goes into production. We offer rise adjustments in 1/2” increments, higher or lower. If you require a rise adjustment, we recommend you first order a standard rise product to determine your waist and fit options, then exchange for a rise adjustment product. There is no additional charge for rise adjustments, however due to their custom nature, we cannot accept returns. To order a custom rise product, please contact us.